2018-2019 Minnesota Pork Ambassadors L to R: Madeline Paterson, First Runner-up, Leyton Becker, Ambassador, Emelia Melson, Second Runner-up. Minnesota Pork Board selected Leyton Becker of Martin County as the 2018-2019 Minnesota Pork Ambassador. Madeline Patterson of Goodhue County was named first runner-up and Emelia Melson of Martin County was named second runner-up. Becker was named ambassador during an afternoon program on Wednesday, August 8, at the Wick Buildings Farmfest forum stage. Lynn Ketelson of the Linder Farm Network emceed the program. 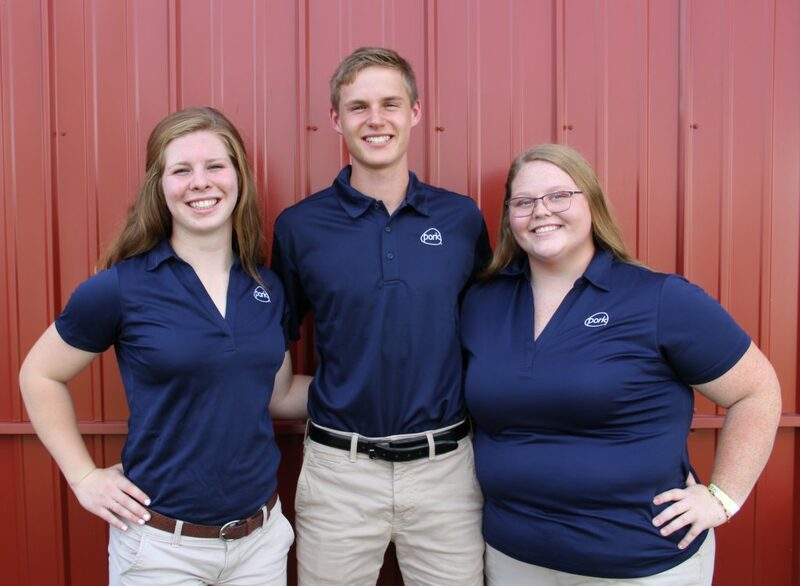 Pork Ambassadors serve as good-will ambassadors for more than 3,200 family pig farmers. Furthermore, ambassadors have many opportunities for professional and personal development. During the program, Emelia Melson from Martin County was recognized for best essay and received a cash award. Madeline Patterson of Goodhue County was recognized as the Congeniality Award winner. This year, eight young people representing five counties competed for the title of Minnesota Pork Ambassador. Candidates are evaluated based on their essay, personal interview, public presentation, and mock media interview. This year’s judges were Galen Johnson of Grandview Hogs; Ashley Ellensohn of Schwartz Farms Inc.; and Wanda Patsche of CW Pork.